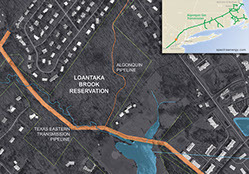 The Algonquin Gas Transmission pipeline – which transports 2.74 billion cubic feet of natural gas per day between New Jersey, New York, and parts of New England – runs directly through Loantaka Brook Reservation. 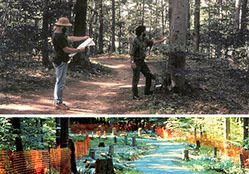 It’s installation through the wooded landscape began 30 years ago, in 1986. 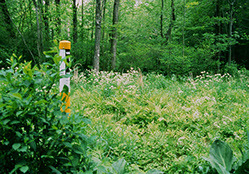 Continual site monitoring suggests that the use of minimally-invasive construction methods during the pipeline’s installation, paired with innovative habitat restoration techniques and stewardship guidelines have resulted in the long-term ecological success of this sensitive, post-construction landscape. 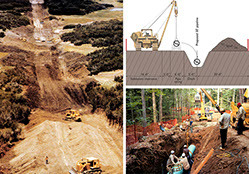 Pipeline installation typically disturbs and compacts a 75 to 100 foot-wide construction zone through the deployment of heavy machinery and straight-path clearcutting. Once the site is cleared, a trench is dug, the pipeline is laid and buried, and then the corridor is kept devoid of woody plants. This last step often provides invasive species an irresistible corridor in which to flourish and migrate. The quality of the Loantaka reservation’s woodlands and mature forest, however, stimulated an innovative, joint approach to pipeline installation and woodland restoration, propelled by ecologically-driven design. Initially, the Algonquin Gas Transmission Company (the pipeline’s owner) proposed a straight pipeline alignment that intersected sensitive habitat and several waterways within the reservation. 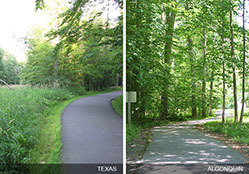 In an effort to minimize disturbance, Andropogon opted to realign the pipeline beneath the landscape’s existing multi-use and bridle path system by connecting a series of short, linear pipe segments to conform to the meandering paths’ geometry. 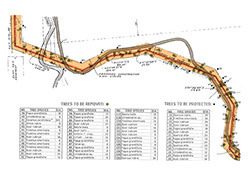 To further limit the construction zone’s impact, disturbance was limited to 35-feet on average, much less than the typical 75 to 100-foot pipeline corridors. Intentional variations in corridor width – from 50-feet in areas of natural opening, like fields, to 25-feet in special situations – responded to the reservation’s naturally varying ecological conditions. This variation also created a more natural look, as opposed to the straight clear-cut that typifies pipeline installations. Construction equipment was carefully selected to further protect the site. Use of a small crane with the ability to side-boom – meaning hoist to the side rather front – allowed access to the pipe’s construction trench without needing extra space for multi-point turns. Additionally, traffic by heavy machinery can wreak havoc on soil structure by compressing the soil’s air-filled pores , and at the reservation, the petite pipe laying machinery weighed 90,000 pounds! 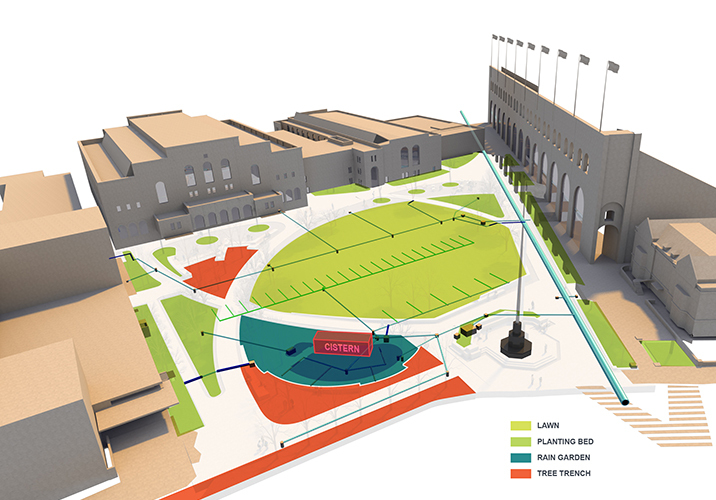 To avoid extraneous soil compaction, the heavy machinery travelled along the existing multi-use and bridal paths whenever possible. Along the pipe-laying trench, the equipment drove over a 4-inch thick woodchip layer topped with excavated sub-soil from the trench itself. This extra “padding” protected the underlying soil and tree roots from direct contact with the machinery. 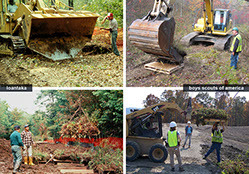 Careful tree removal and tree care further mitigated habitat disturbance during construction. Trees within the construction zone were carefully felled, lowered to the ground with ropes, and then removed or chipped for on-site use. When possible, some trees were only cut down to the ground-level, known as coppicing, in order to promote regeneration through sprouting after construction. Trees outside the construction zone that extended into the corridor were limbed up by an arborist, rather than removed, to provide a 12-foot vertical clearance for machinery. 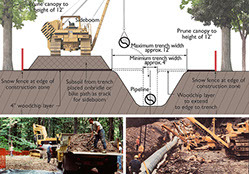 One of the most innovative construction methods deployed during the pipeline installation involved the skimming and transplanting of vegetated soil blocks within the woodland, forest, and wet meadow portions of the corridor. Each day an excavator modified with a flat backhoe blade, or “pie lifter,” scraped soil blocks from the ground and placed them on pallets, which allowed for the blocks to be temporarily moved while pipeline construction commenced. Once the pipeline was installed, the blocks were placed on top of the disturbed area. This method developed for the Algonquin pipeline has implications beyond pipeline restoration. For a recent project in Mount Hope, WV, the Loantaka method for transplanting soil and vegetation sods was employed for restoration of a disturbed zones from mine reclamation. This method was improved to make the cost comparable to typical mine reclamation methods. The project’s careful construction methods and use of vegetated soil blocks left minimal need for habitat restoration. Most revegetation sprouted from the intact seedbank within the vegetated soil blocks. Young whips were planted to decrease this sunlight penetration and replace felled trees, rather than utilizing more expensive container-grown or balled-and-burlapped stock. While the new corridor openings resembled forest glades, Andropogon believed that reestablishing a closed canopy overhead as quickly as possible would help minimize pressure from invasives and deleterious effects of fragmentation, two effects that plague traditional pipeline corridors. In order to assess the ecological successfulness of the implementation strategies after nearly 30 years, the integrative research department at Andropogon Associates performed vegetation and soil sampling in June 2013. 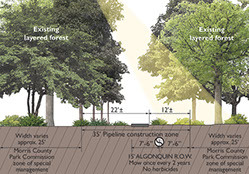 The assessments aimed at understanding how the pipeline construction methods impacted the biodiversity and soil health of the forest by comparing these attributes to areas left undisturbed during construction. The researchers randomly selected study areas within and outside of the pipeline corridor and then conducted a comparative analysis of: 1) Species diversity using the Shannon and Simpson Indices; and 2) Soil compaction using a cone penetrometer. 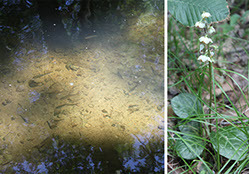 Thirty years later, comparative measurements and observation revealed that the native understory plant communities present in 2013 closely matched the pipeline corridor’s pre-construction species. Biodiversity and soil compaction were found to be better or very similar in the Algonquin corridor compared to adjacent areas outside of the disturbance zone, in almost all instances. Despite these similarities in biodiversity and soil compaction, individual plant sizes, and thus biomass, were less in the construction zone, as one might assume. Additionally, in unpaved areas native species regeneration was observed directly atop the pipeline with slight patches of one invasive species, Microstegium vimineum (Japanese stiltgrass). This healthy species composition reveals a stark contrast to the nearby Texas Eastern Transmission pipeline, which was constructed around the same time as the Algonquin Gas Transmission pipeline using traditional construction methods such as a 100-foot wide, linear disturbance zone. This corridor exhibited low species diversity dominated by Dactylis glomerata (Orchard grass) and other non-native plants. While aligning gas pipelines through sensitive and rich natural and cultural areas, such as neighborhoods and important habitat zones, should always be a last resort in order to protect the health, safety and welfare of all life, it is clear that it cannot be avoided. It is also evident from this case study in Loantaka Brook Reservation, that there can be a better way—that simple and improved methods of gas pipeline construction can be limited in width and implemented in such a manner to not significantly impact our natural resources during the construction process. It is the recognition and understanding that soil structure, soil biology, existing seed banks and native species play a role in ecosystem resilience and should be considered during the construction process to make pipeline construction least invasive. The result of this method is healthier soils and more biodiverse native plant communities when compared to traditional methods of pipeline disturbance and mine reclamation. This method of implementation can be cost-effective and has proven to be a more desirable alternative to traditional clearing-grubbing-seeding methods when biodiversity and overall protection of ecosystem integrity are the goals. 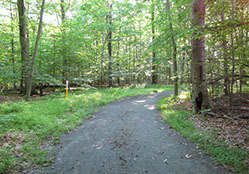 Andropogon worked with the Morris County Park Commission in the late 1980’s to route a natural gas line though the Loantaka Brook Reservation and oversee restoration of the pipeline disturbance. After 30 years, biodiversity, soil compaction and plant health were assessed to determine the successfulness of the project.